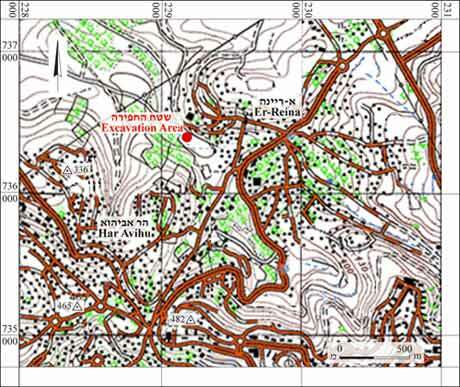 During May 2010, a trial excavation was conducted in Er-Reina village (Permit No. A-5919; map ref. 229200–25/736385–415), prior to construction. The excavation, on behalf of the Israel Antiquities Authority, was directed by A. Mokary (field photography), with the assistance of Y. Ya‘aqobi (administration), R. Mishayev (surveying), H. Tahan-Rosen (pottery drawing), and laborers from Tiberias. 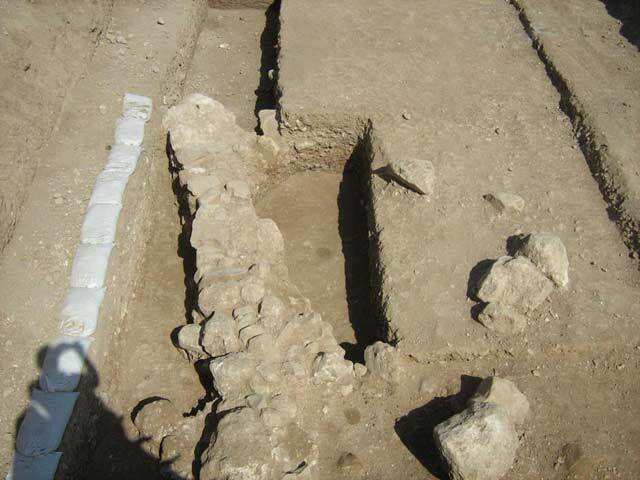 Surveys and excavations had been conducted at Er-Reina village, c. 3 km north of Nazareth; archaeological remains dating to the Hellenistic period were found, as well as workshops for the production of stone vessels. A cave discovered in 2001 at the foot of Har Yona, alongside the road from Er-Reina to Upper Nazareth, contained a workshop for the manufacture of stone vessels (Permit No. A-3557). Stone vessels such as those found in the village first appeared alongside pottery vessels in the Second Temple period and were used in Jewish settlements. 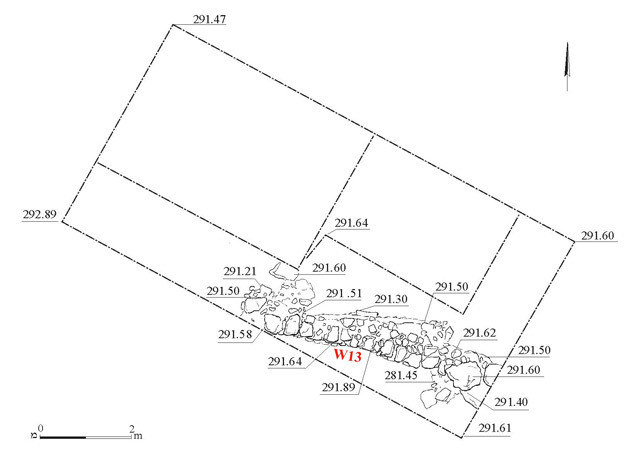 Evidence of another stone-vessel workshop had been found within the precincts of Er-Reina village in the past (‘Atiqot 20:25–26 [Hebrew]). The excavation was carried out subsequent to probe trenches dug by a backhoe that exposed ancient remains at a depth of 1.6 m. The excavation area was located on the northern bank of one of the Nahal Zippori tributaries, which has its source inside Er-Reina village and to this day, drains copious amounts of spring water (Fig. 1). An area (5×10 m) was opened and a top layer of soil (thickness 1.4–1.6 m), comprising alluvium devoid of stones or stream pebbles, was removed. Below it was a layer of packed stream pebbles that was difficult to excavate, which contained building stone collapse. A wall (W13; Fig. 2) was exposed below the two layers; it was built of two courses of limestone along the slope; some of the building stones were roughly hewn and the wall was founded on fill of natural soil. Abutting both sides of the wall was a layer of stream pebbles and tamped alluvium (thickness c. 0.7 m) that contained a large quantity of potsherds dating to the Persian, Hellenistic, Early Roman and Middle Roman periods. The ceramic artifacts included bowls (Fig. 3:3, 4), a cooking pot (Fig. 3:5) and jars (Fig. 3:11, 18, 20), ascribed to the Persian period (fifth–fourth centuries BCE); a mortarium (Fig. 3:1), jars (Fig. 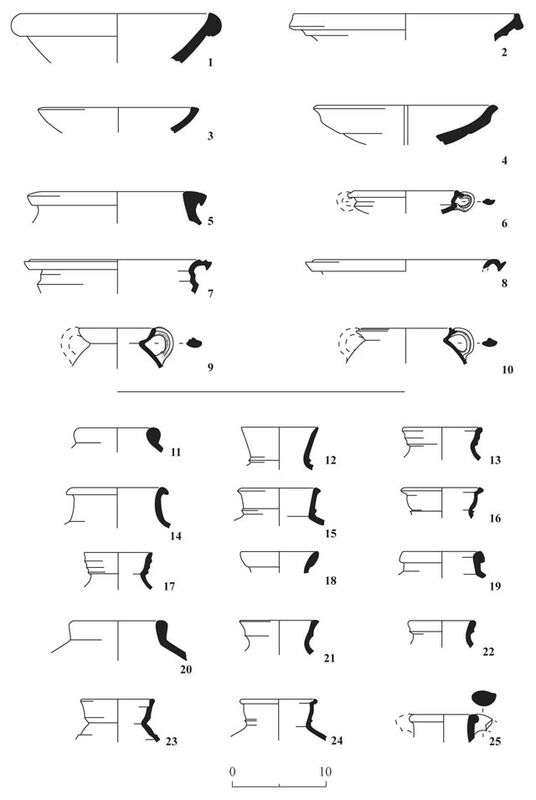 3:14, 17, 19, 21, 22) and a jug (Fig. 3:25) from the Hellenistic period (second century BCE); jars (Fig. 3:16, 23, 24) from the Early Roman period (first century BCE), and a bowl (Fig. 3:2), cooking pots (Fig. 3:6–10) and jars (Fig. 3:12, 13, 15) from the Middle Roman period (second century CE). 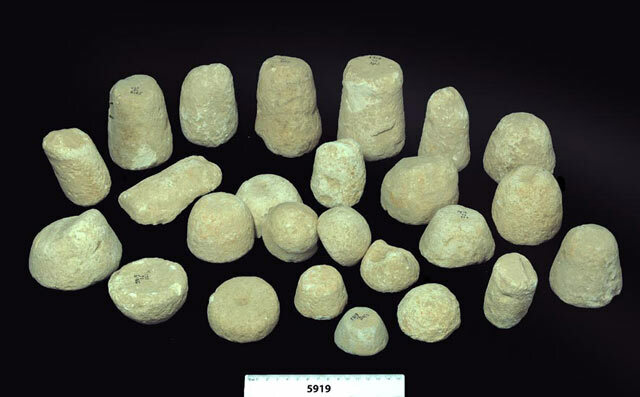 A variety of chalk cores used in the manufacture of stone vessels (Fig. 4), which had been swept into the stream, were found in the layer of stream pebbles. Below this layer was a friable layer of silt, devoid of building stones, potsherds and archaeological finds. The revealed wall was probably built to direct the flow of the stream, for the purpose of agricultural installations or for growing farm crops on the bank of the stream (Fig. 5). A protective wall on the bank of one of the tributaries of Nahal Zippori was exposed in the excavation. The wall was covered with alluvium that contained water-worn potsherds dating to the Persian, Hellenistic, Early Roman and Middle Roman periods, as well as cores of stone vessels. 5. The excavation, looking northwest.